South Africa has an abundance of renewable energy resources. This, combined with the recent drop in technology costs and the need for new power generation as coal power plants reach retirement, provides an opportunity for the country to decarbonise its electricity sector. Managing this process will allow for a just transition in coal-dependent sectors and regions, thus opening new opportunities for current coal sector employees and other job seekers. This study analyses the employment impacts of different plans for expanding electricity generation in South Africa’s power sector. 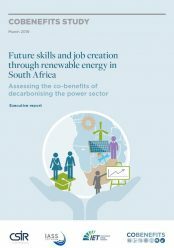 This study is part of a 2019 series of four studies assessing the co-benefits of decarbonising the power sector in South Africa, edited by IASS and CSIR.